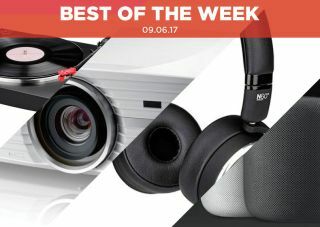 Best of the Week: AKG noise-cancelling headphones, Apple HomePod, new Audio Technica turntable and more | What Hi-Fi? This week Apple unveiled its answer to the Amazon Echo in the HomePod wireless speaker, Optoma launched two 4K projectors and Grado dished out the details on its PS2000e flagship headphones. For reviews, we had AKG's N60NC wireless headphone, Audio Technica's AT-LP3 turntable and Sennheiser's Momentum In-ear Wireless headphones. The July issue of What Hi-Fi? is also out. This "vinyl special edition" contains reviews of turntables, cartridges and phono stages, as well as tips on the how to get the best sound from your deck. There's also a look at the various vinyl subscription services on the market. Apple has announced its own wireless speaker called the HomePod. Following in the footsteps of Amazon's Echo and Google's Home, the HomePod is voice-controlled via Siri. You can access and play music through Apple Music and Siri will answer your questions about the weather, news and sports. It comes in two finishes (white and space grey) and is expected to launch in December. Optoma has revealed details of its UHD60 and UDH65 models, the company's first 4K projectors. There are a few differences between the two: the UHD65 boasts a higher contrast ratio, but the lumens on the UHD60 is higher. Both support HDR and HDCP2.2, come with built-in speakers and two HDMI connections. The UHD60 is on sale now, while the UHD65 is expected to arrive in August. After more than two years of development, Grado's PS2000e headphones have finally seen the light of day. The flagship headphones feature a new driver that minimises signal colouration, and are constructed from metal and maple wood. The PS2000es are already on sale in the US, but there's no word on a UK release yet. These are a wireless version of the wired N60 NCs we saw a few years ago, but they retain the superb performance of the originals. Compact, powerful and well priced, the noise-cancellation is as impressive as it was in the wired version. We can't find fault with them. They're great partners for when you're out and about. In the AT-LP3, Audio Technica has fashioned a turntable for hi-fi novices. All that's needed is a few button presses, and this fully automatic deck is ready to go. It's a very accessible effort, but the real highlight is the sound - expressive, musical and thoroughly enjoyable. At this price, the AT-LP3 is the ideal entry-level turntable for those looking to get into vinyl. Sennheiser has joined the wireless in-ear market with tremendous results. Despite ditching the wires, the Momentum In-ear Wirelesses have a lucid and open sound that features bags of detail and excellent dynamics. The bass can be a bit much and the neckband won't be to everyone's taste, but the performance puts them among the best wireless in-ears available.